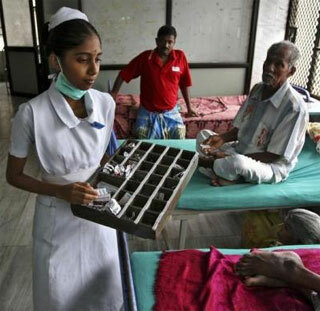 Rediff.com » News » How many rural health centres does your state have? Primary health centres are state-owned rural health care facilities in India. They are essentially single physician clinics usually with facilities for minor surgeries too. They are part of the government funded public health system in India and the most basic unit of this system. Apart from regular medical treatments, PHCs in India have some special focuses. They are Infant Immunisation programs, anti-epidemic programs, birth control programs, pregnancy related care and emergencies. Rediff Labs team analysed the data from ministry of health and family welfare on total number PHCs functioning in different states of India with at least one doctor. There are many PHCs functioning without a doctor where other medical assistants treat the people. The map shows the total number of primary health centres functioning in each state with one doctor, with a lady doctor and without any doctor. The top three states which have the highest number of primary health centre’s functioning are Uttar Pradesh (3,497), Karnataka (2,353) and Rajasthan (2,083). Chhattisgarh has no primary health centre but it has other community health centres. Tamil Nadu and Meghalaya have the high number of PHCs functioning with a lady doctor. Maharashtra and Chandigarh have the highest number of PHCs functioning without any doctor. Child labour: How effective has the ban been in India?